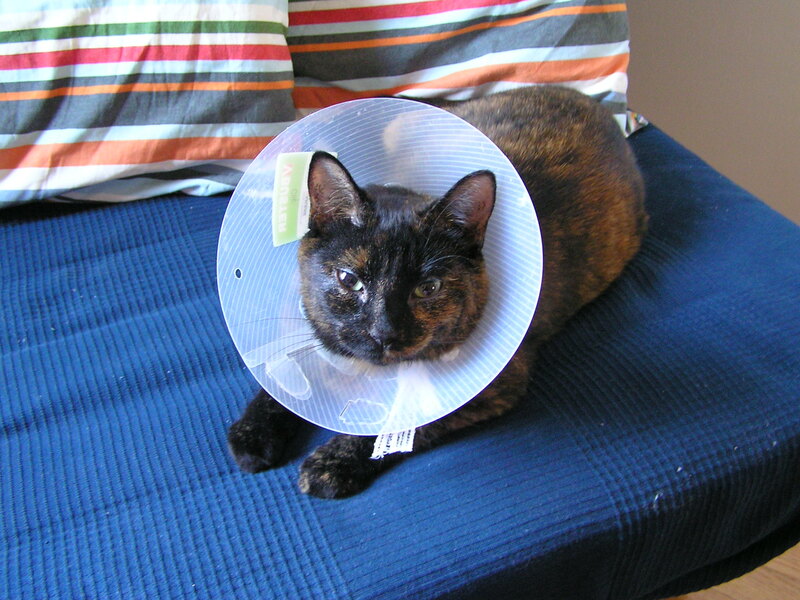 She’ll hate me for sharing pictures of her while wearing the cone of shame, but I had to share this bundle of lovely. This is Emma, you know, Emma Peel from The Avengers? 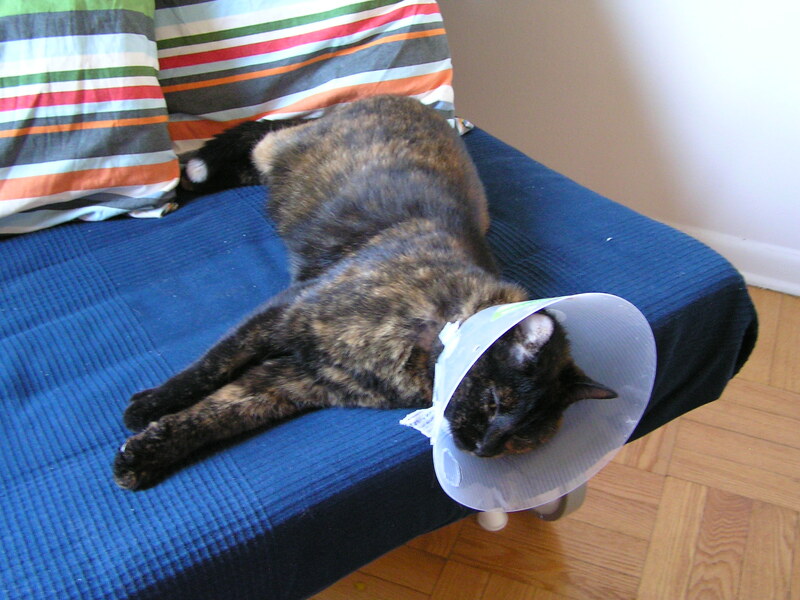 I am fostering Emma for the next two or three years while she is a blood donor cat at the Toronto Veterinary Clinic. I met her last week and she was the one cat who explored the whole room, even found a small hole between the wall and an upper cabinet. Whereas the other three cats all stayed on the floor she checked out everything and showed quite a bit of attitude. When I described her to a friend, Bonnie came up with the name and I loved it. It fits;). Emma is a tortoiseshell cat and has a white tip on her tail. She seems to be settling in alright and has already marked one of the comfy chairs in my office as hers. She’s only wearing the cone while I’m treating her eye. Lol, she hates it and I really wish I could take it off, but we have strict instructions to keep it on until Tuesday. Talk about being thrown in the deep end as a pet parent. We’ve managed mostly okay, but lets just say a lot of treats were involved;). I am excited and a little worried. I hope she likes me and her new home. So far, so good! Have a great Sunday and a fab start to the week. Posted on October 21, 2012, in blog, Fun and tagged cat, Emma Peel, flatmate, kitty. Bookmark the permalink. 8 Comments. What’s wrong with her eye? It’s only a mild irritation. The clinic wanted to make extra sure she was okay and that it didn’t develop into an infection. You’re a great cat mom, Tina. Emma’s a lucky kitty. Thank you, Nancy. I hope so;). She is with a white tip on her tail. Mine is, too, she has an odd, ginger leg. They’re a rather intriguing breed!